With great pleasure I can highly recommend Liam P. Lawlor as a personal private guide in Ireland. He served as our Sacred Irish Tour director for perhaps the single best group tour I have ever been a part of. As such he was with us every moment of the day. He was simply remarkable!!! No question or request was neglected and his knowledge of all things mythical, spiritual and historical was remarkable. Questions and situations that arose were attended to with such finesse and efficiency, we were all amazed. I travel extensively every year and I normally choose a small group tour. Under Liam’s care and direction our group of 12 became a family of friends. He was there always with words of cheer and knowledge. A special treat was the morning meditation of intent for the day, where Liam would ask that we set a tone of reverence and respect of the ancient ones and that we ask for the wisdom of our ancestors as to the right of passage to enter their space. To sum up my review, of Sacred Irish Tours and especially our gentle giant of a tour guide Liam P Lawlor, I would go anywhere in the world with him. I truly hope to have the opportunity to travel with Liam again. As an aside, I would like to thank Thomas (the concierge of my hotel) for recommending the Sacred Irish Tour company. I LOVED being in Ireland for St. Patricks day and the friendliness of the Irish people. It is my intention to come back and experience this magical place again. Absolutely my favourite tour to date. 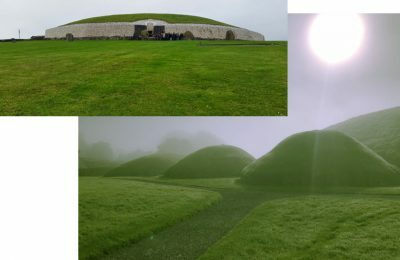 My trip to Newgrange with Liam started early but it was definitely worth getting up. The site itself is impressive and has something mystical about it, but what made it even more interesting were Liam’s explanations about how it was built and what purpose it had. You could see his eyes light up with excitement and passion about the subject and this spark was infectious. Liam brought the site to life and I absolutely enjoyed listening to him! I can’t wait to go on another trip with him, an amazing experience I would recommend to anyone! In February, my sister and I decided to go on a day trip through the Dublin Mountains with Liam. Originally, we had intended to go on a 2-hour hike but as soon as we reached our destination, it started to snow heavily. Luckily for us, Liam was well prepared and able to improvise. 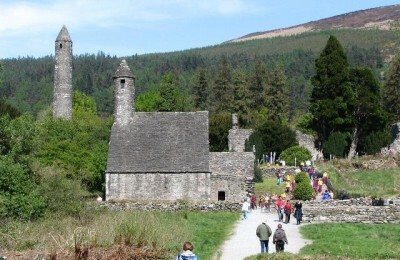 He drove on to the Wicklow Mountains until we reached the monastery at Glendalough. Thanks to the visitor center and Liam’s detailed knowledge about Irish history and culture, we learned some astonishing facts about the early church in Ireland and the famous monk Saint Kevin. 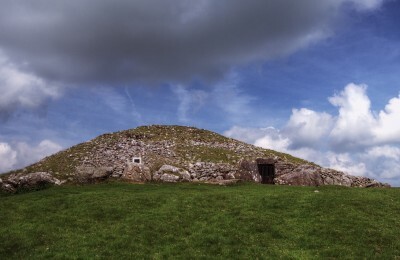 At this point, I would like to stress that Liam does not only possess some superficial ‘typical tour guide knowledge’ but real in- depth knowledge about ancient history, megalithic culture and even physics. We visited the burial site full of ancient tombstones nearby and the lakes, which have been used as film locations for ‘P.S. I love you’, ‘Brave heart’ and ‘Vikings’. Afterwards, Liam took us to see Powerscourt Estate, where we had a tasty dinner in the Avoca Café and took a walk through the beautiful Powerscourt Gardens, known as one of the world’s greatest gardens. Throughout the whole trip, Liam was very friendly, helpful and entertaining (we even got to listen to some of his favorite bands from Dublin in the car, which we loved!). You could easily see from his enthusiastic manner, that he enjoyed going on this trip as much as we did, which mad this day trip an unforgettable and unique experience for us. Thank you once again, Liam! We are really looking forward to go on another trip with you soon.